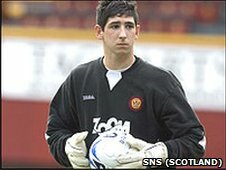 Leeds United and Scotland Under-21 goalkeeper Alan Martin has signed for Barrow on a loan deal until January. Martin, 21, made 25 appearances for the Bluebirds while on loan during 2008/09, and played 10 times for Accrington Stanley during a loan spell last term. Barrow have also handed trials to former Morecambe keeper Steven Drench and ex-Luton defender Lewis Emanuel. Bayliss told BBC Radio Cumbria: "There should be news on a left-back hopefully by Saturday." Drench, 29, began his career with Blackburn Rovers as a trainee before joining Morecambe in 2006. He made 47 appearances in the Shrimps' promotion-winning season of 2007/08 and picked up the player of the year award. He has also had spells with Southport, Cambridge United and Leigh. Emanuel, 26, has made over 100 appearances in the Championship for both Bradford and Luton and is a free agent after failing to return to Kenilworth Road this summer, despite being given the chance to earn a new deal with the club. He has also been capped by the Republic of Ireland at Under-21 level. "We're not panicking," Bayliss said. "We're keeping cool and we want to make sure we get the right players in. "They have to be of the right personality and the right character before we bring them in. "We've done well during our time at the club and the real supporters appreciate that and I'm sure they won't mind waiting for the right players to come in." The Bluebirds completed deals for defender Matthew Heywood and winger Marc Goodfellow this week. "Marc was always going to sign for us," Bayliss said. "It was just a matter of time... he's been with us all pre-season and he was just waiting for certain things to get sorted at Burton. "With Paul Jones getting injured it was obviously important for us to bring a powerful centre-half in to the club and I think Matty Heywood fits that bill. "He's only 30 years old as well so he's not over the hill and he'll be a good influence for us," he added. Heywood and Goodfellow join Ciaran Donnelly and Danny Forrest as new arrivals to Holker Street this summer. Barrow round-off their pre-season itinerary at home to a Bolton Wanderers XI on Saturday. "They said they are going to send a strong squad with some first-team lads in it so it will be good for supporters to see some names," Bayliss said.